So for the last few days I've been going through the final steps of updating Html Help Builder to properly run under Windows Vista without any file permissions, registry or other sort of elevation requirements. In theory the application should run fine after installation without any sort of crutch like Folder Virtualization. Testing this stuff and trying to isolate file 'violations' can be tricky under Vista, because Vista - with UAC on - automatically has Folder Virtualization enabled. 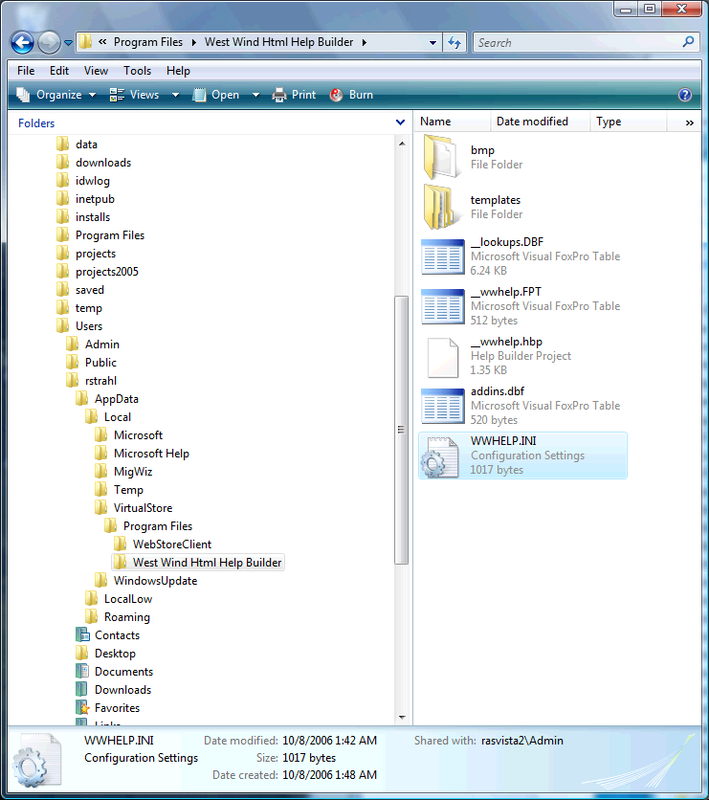 Folder Virtualization attempts to detect a non allowed file operation like a write operation in the install directory and automatically copies the file to a virtual folder (in your Documents/AppData store) and updates the file there. Folder virtualization sounds like a nice workaround, but it has two problems: It seems that it really slows file operations down noticably and it can cause big problems if more than one user needs to use an application and share the data in in the install directory (I'll come back to this in a minute in regards to file updates). 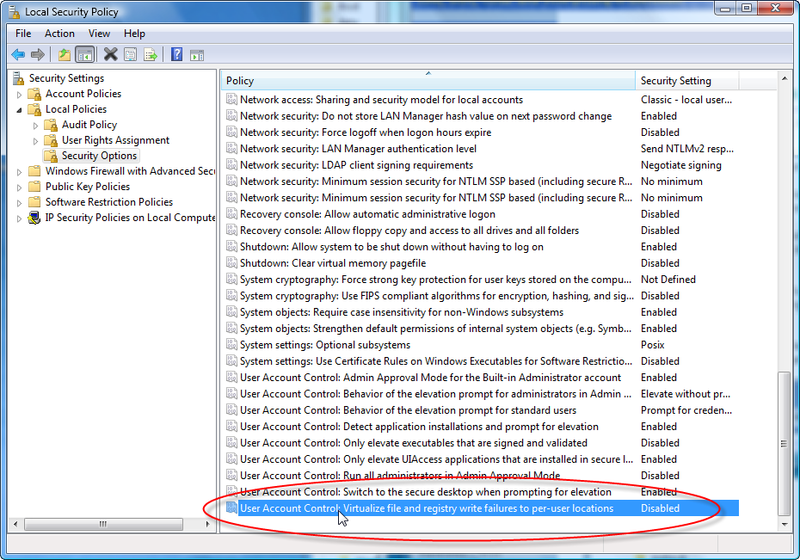 Make sure to log off and log back on which is required before security policy changes are applied. This allows you to run your app and have it blow up (or whatever it will do) whenever it tries to write local data. While checking out Html Help Builder I ran into a number of the small issues mentioned above, like writing configuration information and creating on the fly compiled code for a couple of odd man operations (usually this stuff happens in actual project locations which are in the Documents folder, but if no project is open <s>). Unlike the picture above if you've cleaned up your app properly there shouldn't actually be a virtualization folder at all! If you do see files in this location it means there are still some parts of your application writing locally where they shouldn't! So how do I get around this issue? Not very gracefully - I let the user know and prompt with a detailed error message. Detailed enough for 'ya? This is a nuisance for sure but I think it's vital that the user is given enough information to proceed at this point so this dialog pops up explaining what options are available. The code checks whether the user is an Administrator with the IsUserAnAdmin Win32 API call which correctly identifies the user's 'real' Administrator status in Vista. So even with Admin Approval mode enabled and running as a 'pseudo admin' user this function will return false and cause this dialog to be raised. In case you're wondering - no that's not a standard Vista dialog but a custom dialog window I have in my library that uses a Web Browser control to generically display longer messages to the user along with the ability to add arbitrary buttons to the dialog. <s> It comes in very handy for displaying longer messages that would be overkill for a message box - the additional formatting that even simple HTML provides really helps (hey this is one thing nice in WPF - that sort of thing is native!). 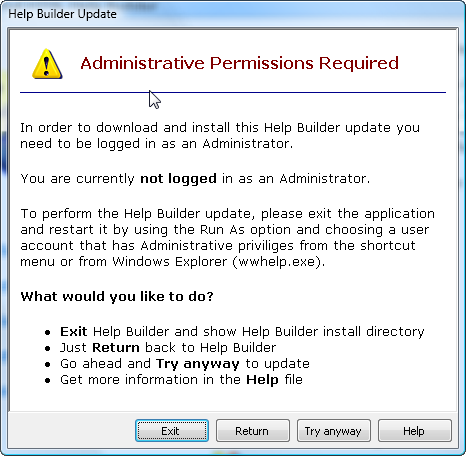 If the user chooses to update now and run As Administrator the update process works correctly by downloading the update into a temporary folder then launching the updater which inherits the Administrative Rights because it's a child process, and then then updates the original application and restarts. There are a few other things that get similar treatment in Html Help Builder. For example, you can choose to re-register various components by re-registering the Html Help Builder COM component or the .NET Interop assembly used for importing .NET assemblies. Another scenario is where the user doesn't have the .NET runtimes installed at time of installation so COM Interop registration has no effect (no RegAsm available at install time) then later installs .NET (or a different version of .NET). Although .NET is now installed Html Help Builder does not have the COM Interop assembly registered. Internally Html Help Builder checks for registration and tries to register if it's not already registered. This also no longer works in Vista with UAC because COM registration requires Admin rights. The same approach with the dialog is taken for this now, although it's not as flexible as before - previously you could just use a feature and Html Help Builder would check if installed and if not do it right then and there. Now an explicit step is required to make this happen. So from an application perspective a lot of little changes like this were required, and while it all feels a lot more restrictive providing a less friendly user experience at the same time I also realize that these are not make or break issues and for the sake of security it's probably Ok to have to give them up. Duncan GREAT TIP!!! The .NET code doesn't help me because this isn't a .NET application, but it does also work with ShellExecute which is great. Thanks for the heads up, I just ran into this yesterday and if it hadn't been for your blog I would have been highly agitated trying to figure out what in the world was going on. Could you allow the Administrator to store NT user details and use the LogonUser set of API's to do impersonation when required. I suppose the Shellexec is a much simpler method. You could do this with your own prompt though (instead of storing) and try and use impersonation in this case. I'm not too sure about the complexity of the API and rights required on Vista though. Just thought it gives you a little more control over the situation. But event if it does - would you really trust an application to type in system user name and password? That's a pretty scary affair if you're typiing this into a black box app that you don't necessarily know what its doing. If it did work though the more interesting thing might be to impersonate some built in account (like SYSTEM) which would give you full access... If anybody tries this I'd be curious to see whether that would work. I found something close in a forum. You might try there.